This event is put on by Meridian 5.41, who have created a Last Friday of the month for one night only at Archive Homestore and Kitchen cafe in Ramsgate. Each month it is a different local artist, who has the space to explore new ideas or work in progress. The artist has two hours to put up and two hours to show and then take down, quite a constraint! But a great creative challenge. Resonance installation is informed by the sounds in my environment, the chinking of the metal of masts and wires in Ramsgate marina, the bells on buoys at sea and the clinking of cooling glazed ceramics. It is made with high fired stoneware, terracotta and porcelain clays. 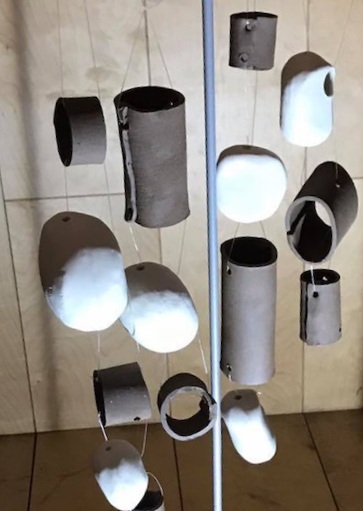 A series of interactive pieces, allow people to touch and walk through to create sounds - metallic chiming slices, clunking spheres and clinking terracotta discs. It encourages people to enjoy, play and have fun connecting with the elements of this show. At the event people were hesitant and then delighted that they could touch, lots of smiling happy faces and creating so much noise/sound with their hands and bodies. This project was totally out of my comfort zone and my first installation but I have had a great time working on it and now have lots of ideas from this to work on.